Studying dance is a challenging and rewarding experience. It offers the opportunity to extend and develop your dance technique and choreographic skills, while you study and engage in academic and vocational studies. We offer a challenging experience to study Contemporary Dance taught by expert dance teachers and researchers in a stimulating environment - specialise in areas such as Dance Performance, Choreography, and Dance Movement Psychotherapy. You’ll also have the opportunity to undertake a work placement with a high-profile dance company, arts organisation, or educational setting, which will help you to access a number of areas of employment. Links to employment and future careers are essential and students have the opportunity to undertake: a dance placement, work experience in teaching or performance, and teaching as part of our 3Fall Dance Company. You’ll be guided by the module tutors and our active careers service to identify and channel your knowledge, skills and talent. I'm currently a second year Dance student at the University. After my final year I plan on travelling the world and discovering what dance means to different individuals in different cultures. I'm in charge of running the blog for the dance department, so to stay up to date with everything that's happening this year, and see what our talented staff members and students have been getting up to - give the blog a follow! 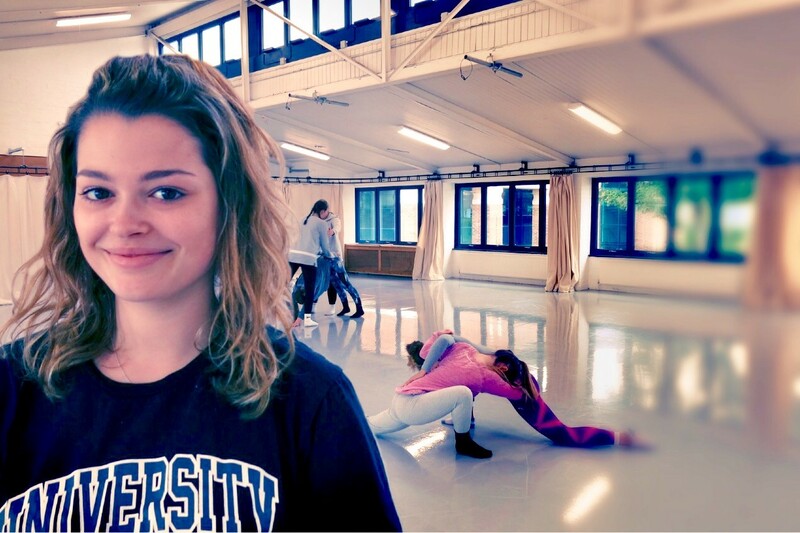 Choreography is the central focus of study here at Chichester. Through this, you’ll develop the creative, imaginative and interpersonal skills that will help you to realise your dance potential. You will be offered a selection of modules that are currently taken by the BA (Hons) Dance students and will be guided by lecturers according to your prior knowledge and experience. This will include the Dissertation module together with a number of choice modules. This programme provides you with a variety of experiences that will prepare you for your chosen career direction. At Chichester, we teach in small groups and pride ourselves on the quality of the learning environment we have created for our students. The Dance courses are delivered on our Bishop Otter Campus where the Learning Resource Centre (LRC) is the hub of your learning environment. It has two upper floors of library resources with dedicated areas for silent work or group study, while on the ground floor you will find the Support and Information Zone, Media Centre, Otter Gallery, Costa Coffee and a variety of IT resources. There are over 130 open access PC workstations, 45 Apple IMacs and ample printing and media facilities. A state-of-the-art wireless network offers fast internet as well as access to all our online resources. You will also have a dedicated subject librarian who will be available to help you access all the library resources you need for your course, both on the shelves and online. Dance offers a variety of exciting career options. Recent graduates have achieved a wide range of successes since moving into areas of performance, teaching, administration, postgraduate study and research. You’ll be guided by our team of specialist dance tutors and visiting dance professionals to develop your interests and find the career path that most suits your interests and skills. Preparation for further study and employment is an integral part of our Dance Programme, and jobs our graduates have secured include choreographer, community dance practitioner, arts administrator, and a dance journalist. The Dance department is a leading provider of excellence in dance education and draws on the expertise of the teaching team. The team is made up of international professional dancers, choreographers, researchers, writers and directors. Each member of the team is renowned for his or her theoretical and practical expertise. You’ll work with, and learn from, a wealth of professional specialist tutors whose backgrounds stem from highly respected performance companies. The team aims to foster the next generation of dance performers, choreographers, writers, dance filmmakers, teachers, somatic practitioners and community artists. Your learning will encompass the development of dance knowledge and skills intrinsic to dance practice. Learning is supported by theoretical inquiry and debate, to provide you with the ability to contextualise your learning within academic frameworks. You will be assessed through a variety of methods, including written essays and reflection, practical demos, performance, presentations, group project work and practical exams. You will be encouraged to monitor your own progress, giving you the opportunity to discuss any issues with your lecturers during your course.